1. We make everyone else’s “farm-to-fork” trend look like amateur hour. You know how other places say, “It’s not a trend, it’s a way of life?” Well, here, it’s also our history. We’re known — and have been for a while now — as America’s Farm-to-Fork Capital: Our produce is shipped all over the United States year-round and we have around 40 farmers’ markets. 40. Four-zero. September is devoted to farm-to-fork events and restaurants, culminating in a large gala dinner on the famous Tower Bridge (the event is simply called the “Tower Bridge Dinner”). The locally sourced, five-course meal is served to over 800 guests, and tickets routinely sell out in seconds (if you’re interested, be sure to plan ahead!). Picture an extremely long banquet table running down the middle of the bridge, set with wine glasses, table cloths, and fresh flowers — of course it sells out. For something more accessible, check out the Farm-to-Fork Festival on the last Saturday in September. It’s a combination of chef demonstrations, local farmers selling their goods, food ready to be tasted, and live music — all on Capitol Mall. But if you’re not here in September, that’s not a problem. Both the Midtown Farmers’ Market and Sunday Farmers’ Market are open year-round and serve up food demonstrations, fresh produce, and artisan crafts. And they’re not alone — others are open year round, too. And if you’re looking for one simple Farm-to-Fork Capital staple? Go for the tomato. We have some of the best you’ll ever taste. 2. “City of Trees” is Sacramento’s nickname for a reason. True, Sacramento has its fair share of nicknames, but one of the favorites is “City of Trees.” Though it’s a bit difficult not to lose count, our city has the most trees per capita of any other city in the world (though some say Paris takes the top spot). These elms, oaks, and sycamores provide a totally green aesthetic to our community and much-needed shade in the summer months — they can actually lower ground temperatures by 36 degrees on a hot day. This nickname also gave life to a popular, alternative music festival called, of course, City of Trees. This year saw bands like Weezer, Panic! At the Disco, and at least a dozen others. This one-day event takes place in September and has two stages (and a tent, with more tunes), food vendors, and — believe it or not — lots of cold beer. 3. The original city is actually underground. Let the ghost stories commence. In 1862, Sacramento was hit by a massive storm and the subsequent flooding ended up being among the worst in California’s recorded history — so intense that it created a temporary inland sea. A lot of the locals were forced to relocate, at least temporarily — including the local government, who hightailed it for San Francisco for over a year. Those that stayed behind persevered, worked on raising the streets (literally), and ultimately saved the city. This ended up creating underground spaces and walkways that are more than nine feet below ground. 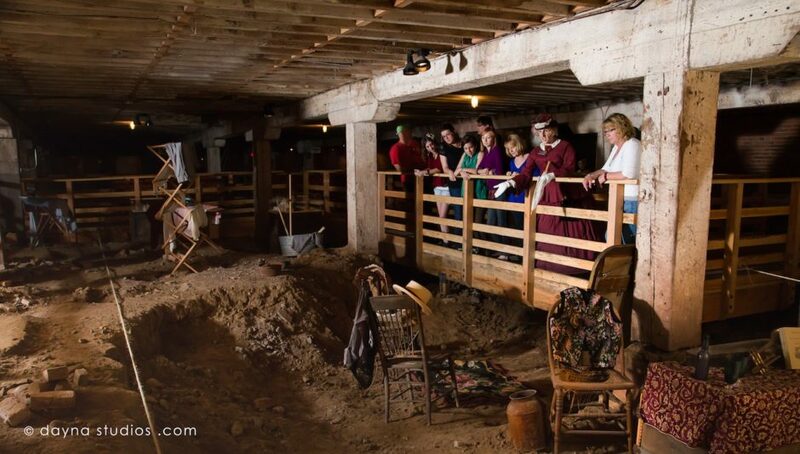 These days, underground tours, put on by the Sacramento History Museum, take visitors down into the tunnels to share stories about the businesses and lives that thrived below our feet — and to rave about the Sacramento spirit that helped the city to re-build. 4. The new Golden 1 Center is part sports, part music, part slow food movement — and all parts progressive. Golden 1 Center, the new home of the Sacramento Kings, opened this year and kicked things off right with a Paul McCartney concert. The lineup for the coming fall and winter, athletics aside, includes acts like Pentatonix, Stevie Nicks, Twenty One Pilots, and Kanye West. What might be even more impressive, however, is that the arena is officially LEED platinum-certified — because it’s the first entirely solar-powered arena in the world. Yeah. And — and — it’s the first arena in the NBA to have all-gender restrooms. 23, actually. Coolest, most progressive, most technologically advanced arena ever? Definitely. 5. We have the oldest public art museum west of the Mississippi. The Crocker Art Museum has been showing art since 1885, way before most of the country had places to hang it. It’s located in the Crocker family mansion, which is a piece of history in itself: The house was finished in 1872, and even then it had a bowling alley, skating rink, natural history museum, a library, a gallery — and that’s just the first and second floors. Nowadays, this California Historical Landmark contains collections of Californian art, international ceramics, and 19th-century central-European paintings that were collected on a Crocker family trip to Europe. The Teel Family Pavilion, built in 2010, is connected to the house — with its white, sleek architecture, its juxtaposition with the Crocker creates an interesting mix of modern and historic. Both combined are a great way to soak in the progression of Sacramento culture. 6. Parts of the city are said to be haunted. In a historic city like Sacramento (and a buried one), there’s bound to be ghost stories. Rumors include tales of a former governor’s dead son appearing on 8th and M Street, old ghost miners showing up on Prospector Road, and books flying off the shelves in the California State Library. A favorite story is that the Sacramento Theater Company on H Street has a glowing pink orb, nicknamed Pinky, that floats from room to room. 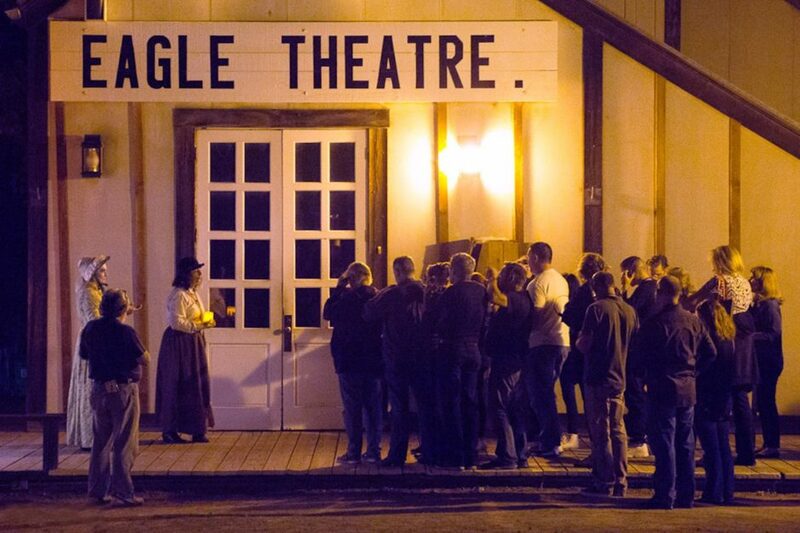 In October, the Sacramento History Museum puts on Ghost Tours that delve into the eerie moments of the city’s colorful past. One mile and an hour long, this is the way to kick off Halloween. Forget reruns of ghost movies — this is the real thing (kind of). 7. Here, train culture is alive and well. Sacramento is clearly a progressive city, but it’s also proud of its history. Case in point: the California State Railroad Museum. The nation’s first transcontinental railroad broke ground in Sacramento in the 1860s, informing a large part of the city’s culture and officially establishing it as the terminus of the first railroad to run coast to coast. Inside the museum, you’ll see a golden spike identical to the one Leland Stanford pounded into the ground in Promontory, Utah, uniting the eastern and western sections of the railroad. You’ll also find a number of preserved train cars to walk through and 225,000 square feet of exhibit space. The museum traces the development of rail travel from novelty to luxury, and tells the story of how this one-time revolutionary technology shaped the development of the nation. 8. It’s home to “the world’s oldest” and only non-swim triathlon. Heading into its 44th year, Eppie’s Great Race is one of the biggest kayaking events in the States. Instead of swimming, participants paddle their way to the finish line. The race consists of a 5.82 mile run, 12.5 mile bike ride, and a 6.10 mile kayak route down the American River Parkway. But apart from free pancakes and crazy bragging rights, proceeds benefit those with special needs and developmental disabilities. Since its inception, Eppie’s has donated over $1 million to the cause. 9. Since 1900, there’s only been three recorded events of significant snowfall. Snow in Sacramento is extremely rare. So rare, in fact, that there hasn’t been a decent amount of accumulation since 1976 (when there was two inches). Dustings come and go, but Sacramento stays basically snow-free. 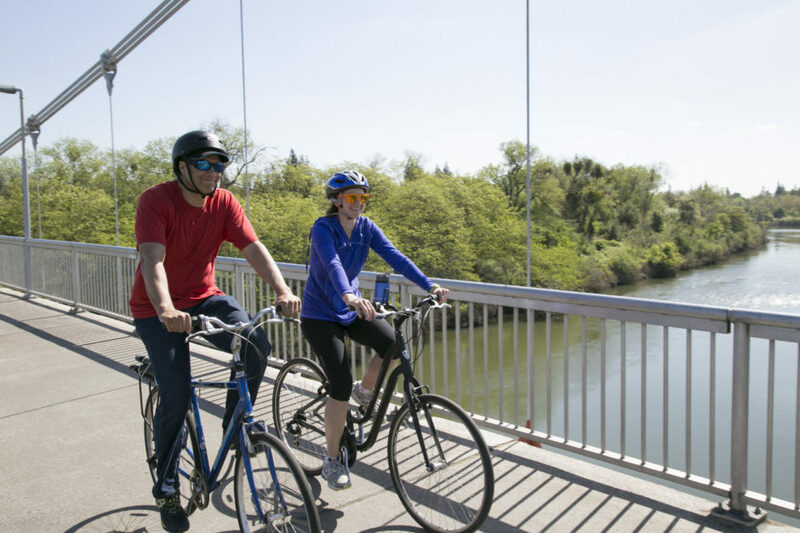 The city enjoys a Mediterranean climate, which means we can spend a lot of time walking and biking the nearby American River Bike Trail, hiking, whitewater rafting, kayaking, and just enjoying afternoons year-round under our shady trees. 10. One of the few International World Peace Rose Gardens is in the State Capitol Park. There are nine International World Peace Rose Gardens around the world. Sacramento hosts three of these: one in an elementary school, another is a sister garden to one in Mexico, and the last is the oh-so-colorful garden in the State Capitol Park. The World Peace Rose Garden takes up .42 acres of the park and includes over 140 varieties of roses, colors, and fragrances. Throughout the garden, there are Inspirational Messages of Peace, written by children, and roses named after veterans near the Vietnam Memorial. The park also offers sweet views of the Capitol (it’s basically DC’s stunt-double), and there’s a museum to visit as well. 11. The gastropub scene here has completely exploded. Sacramento has often been in the shadows of other California cities when it comes to the dining scene, but recently, downtown has come alive with new restaurants, bars, and the always-popular gastropub. There are close to 50 craft breweries in the area, too. Hawks Public House is a favorite that serves up a mean house-ground Wagyu beef burger with mushroom-bacon marmalade. Only a year old, Empress Tavern has a seasonal, rotating handle of beers and unique cocktails — like the Empress Caesar, which is basically a Bloody Mary with celery salt, smoked clam, and Aylesbury Duck Vodka. They’re in the basement of the historic Crest Theatre, an old vaudeville palace. 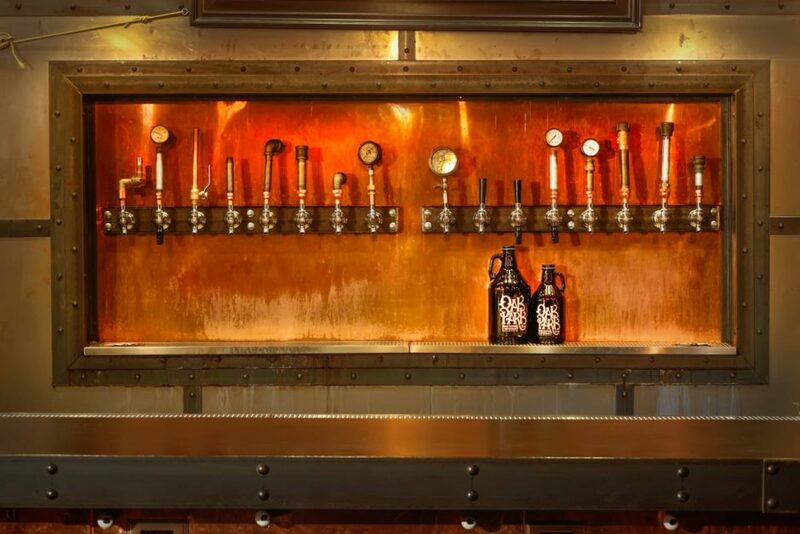 Oak Park Brewing Company, one of the most well-regarded in the region, offers British and Belgian-style beers paired with locally-sourced menu items (and is dog-friendly to boot). All this to say that it’s official: That whole “farm-to-fork” thing has definitely paid off. 12. It’s one of the most underrated coffee cities in the US. Don’t be surprised if you start to hear that Sacramento, is one of the “world’s best cities for coffee lovers” or a city “that’s earned its coffee bragging rights.” Sacramento gets forgotten in the coffee world when there’s heavyweights like San Francisco and Seattle on the West Coast, but the city’s coffee culture is finally starting to be recognized. Local hot-spot Temple Coffee Roasters was inspired by a trip to Indonesia and the sense of community on a tour of local temples. The cafe on 9th street channels that inspiration with communal tables and a pour-over bar. The largest location, on 22nd and K, offers a dessert and coffee pairing menu, along with Nitrogen-infused coffee and tea. Open since 2011, Insight Coffee Roasters is another popular coffeehouse in Sacramento. Coffee education is a large part of their company and they give complimentary origin tastings and brew demos. Here, you can always feel the buzz. This post is proudly produced in partnership with Visit Sacramento.